If you need a robot to traverse piping systems, what are you to do? 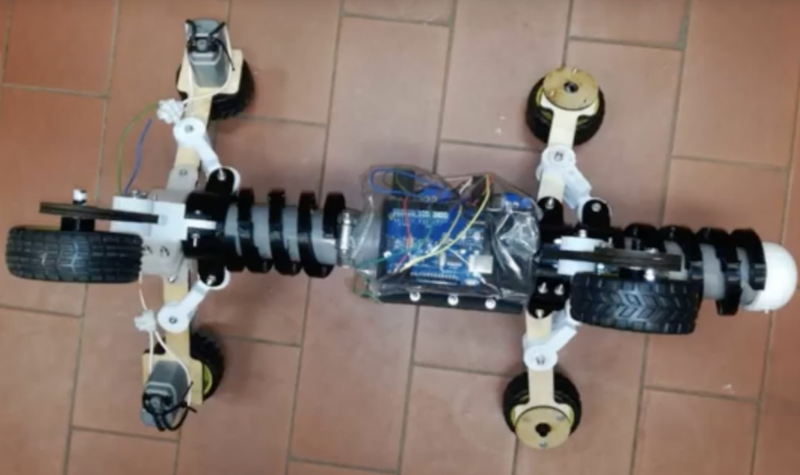 You could purchase a (very expensive) inspection robot, or you could instead build your own like the prototype pipe-crawler presented here. The device features six spring-loaded wheel assemblies that help it get a grip on different diameters of pipe, with two of the wheels powered for locomotion. An Arduino Uno controls the uniquely-shaped bot, with an LN298N H-bridge used to regulate the three 9V batteries wired in series that run the motors. Pipeline systems deteriorate progressively over time through various means. Pipeline inspection robot are designed to remove the human factor from labour intensive or dangerous work environments and also to act in inaccessible environment. However, if you take a look at the prices of those robots you will find that they are way too expensive. 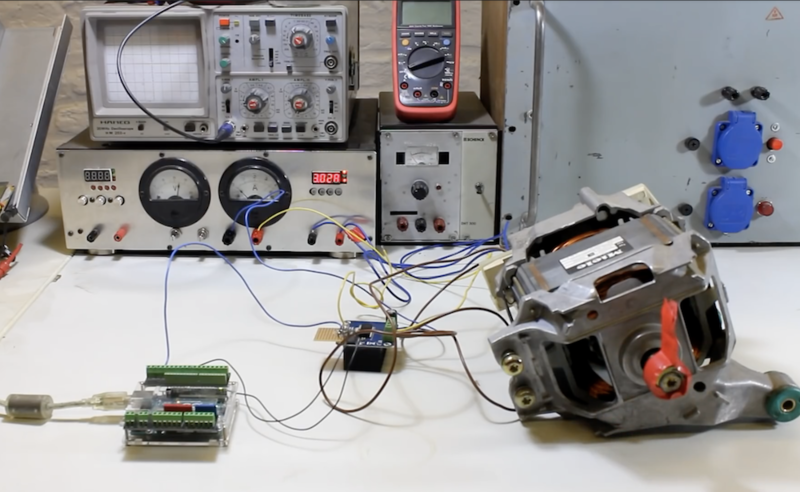 This project aims to create another kind of pipeline inspection robot. Because we think that It is beneficial to have a robot with an adaptable structure to the pipe diameter, and cheaper at the same time. Our challenge is to make this robot adaptable to diameters varying from 260mm to 390mm based on two sliding mechanisms. 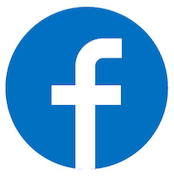 Be sure to see it in action in the short video below! In the middle of a project, you may find that what you’re making is similar to something that’s been done before. 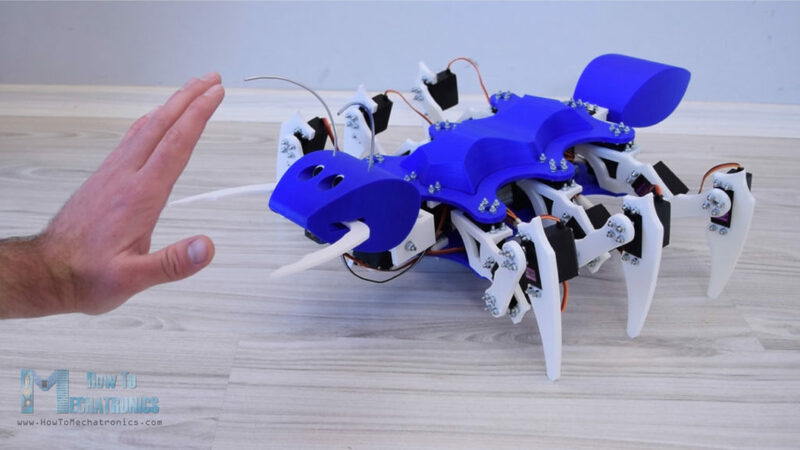 Such was the case with Adrian Lindermann when he started constructing his “Twinky” robot and found the Jibo social bot had a similar design. 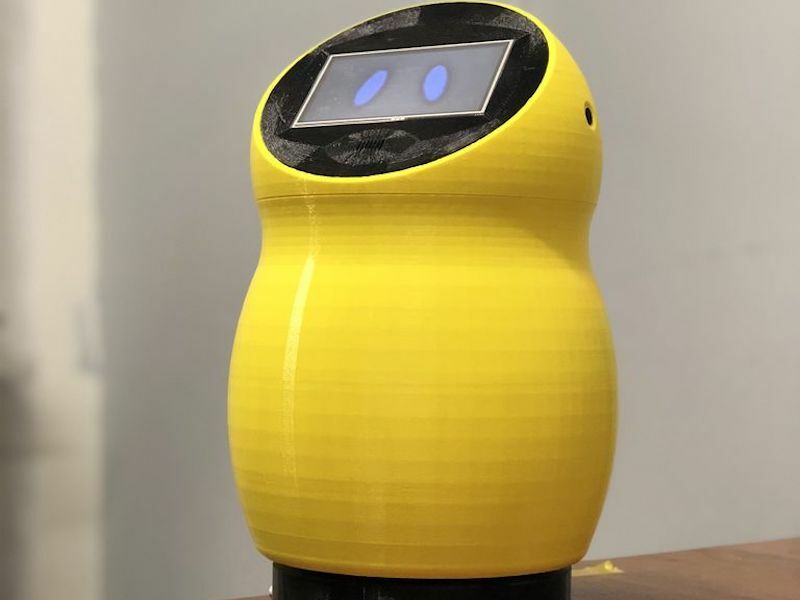 Like any good hacker, he pressed ahead with his build, creating a small yellow companion that can respond to voice commands via a SpeakUp click module, along with pressure on its face/touchscreen. Control is provided by an Arduino Mega, and Twinky can interact with other devices using a Bluetooth module. The robot’s head can even turn in order to point the display in the needed direction, and it’s able to play sound through an audio amplifier and speaker. 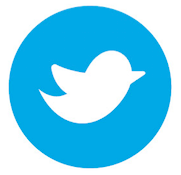 IT CAN SPEAK! PLAY MUSIC, SET TIMERS, ALARMS, TURN ON/OFF THE LIGHTS OR OTHER APPLIANCES. IT HAS A CALCULATOR AND A WEATHER STATION! DATE & TIME, BLUETOOTH 4.0, EVERYTHING WITH VOICE COMMANDS!!! And also with a touchscreen, it has one little motor so it can turn around when one of the two microphones hear you talk or make a noise. 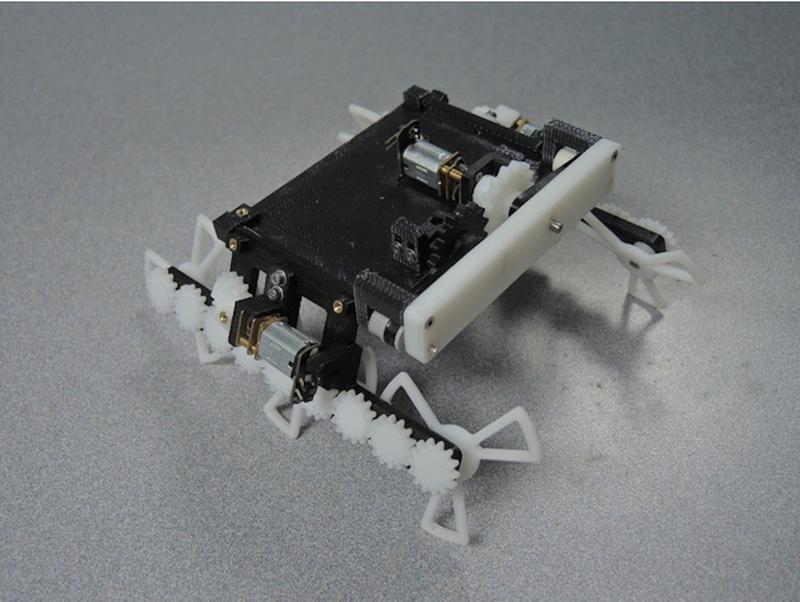 For more on this wonderful little robot, check out the project’s write-up and and build files here. 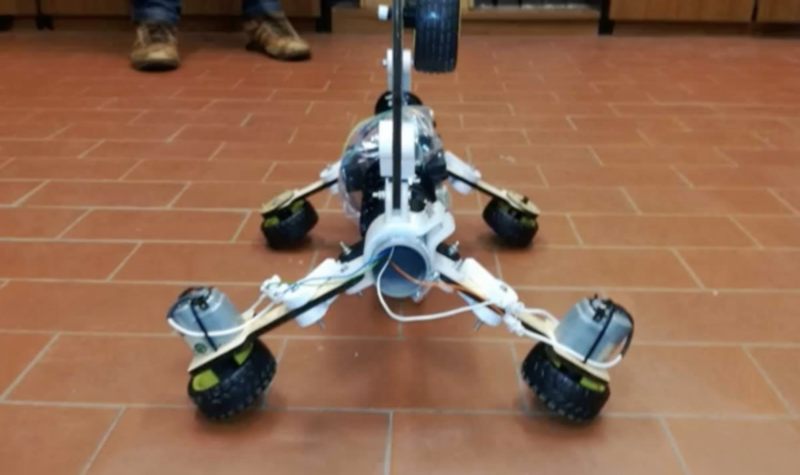 While the STAR, or Sprawl Turned Autonomous Robot, is more than capable of traveling over obstacles with its three-pointed wheels, it can also make itself thin enough to simply slide under others as needed. 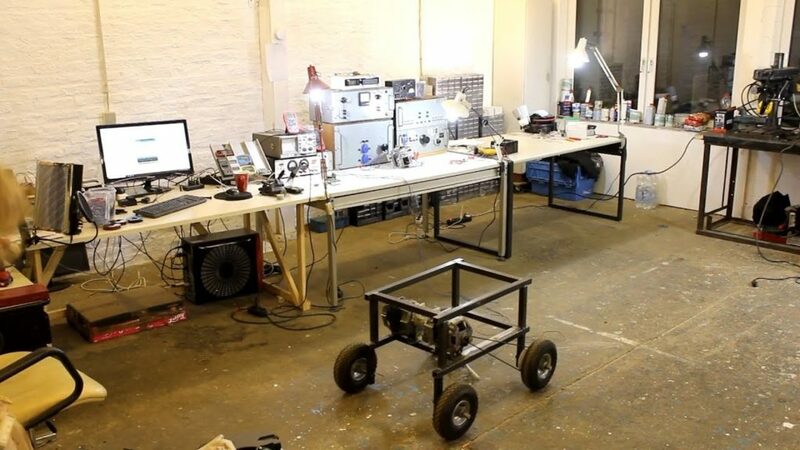 This clever design uses an Arduino Pro Mini for control, and normally moves around like a tank, rolling on six wheels that are turned by two motors. 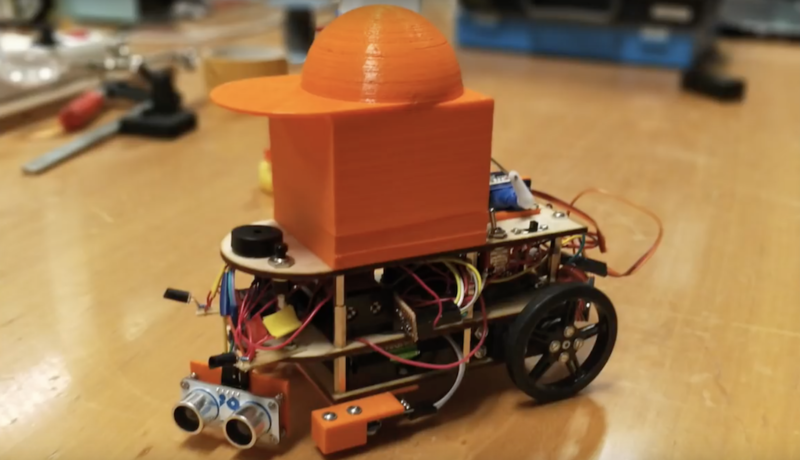 When the task calls for it to go under something, a third motor cranks these wheels to nearly parallel with the floor, shrinking the robot down to a very slim profile—so thin, in fact, that it can actually slide under a door as seen in the video below! Print files and more information on the build can be found here, while the original paper upon which this robot is based is also available. 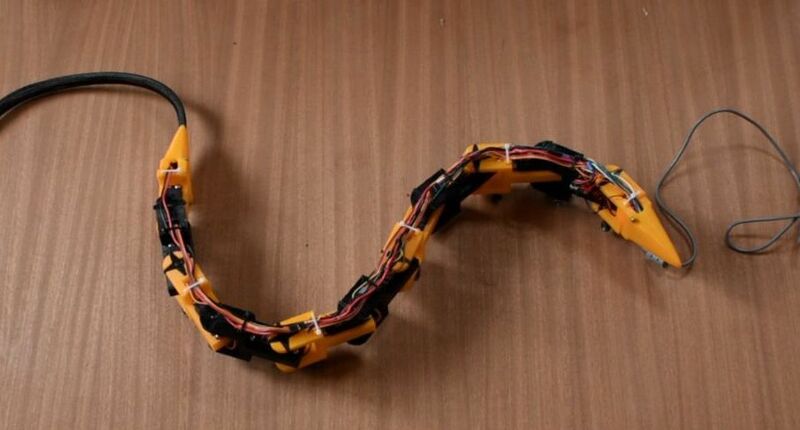 Would you like to create a robot that slithers from place to place like a snake? 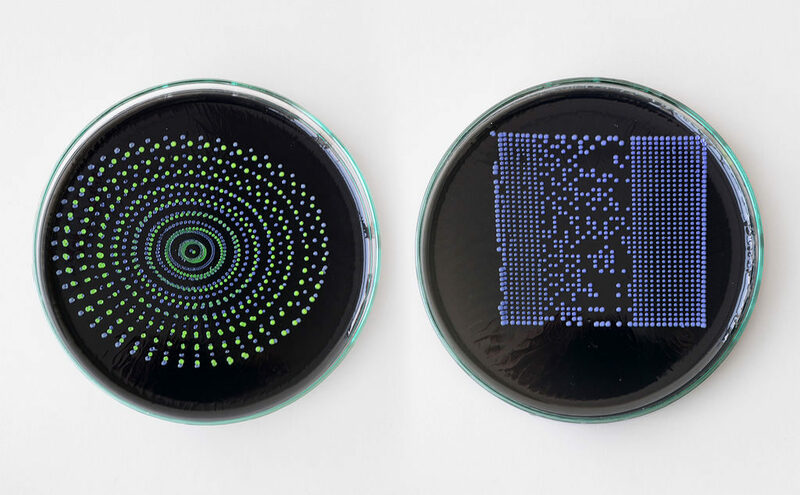 Well now you can, thanks to this bio-inspired design from Will Donaldson. 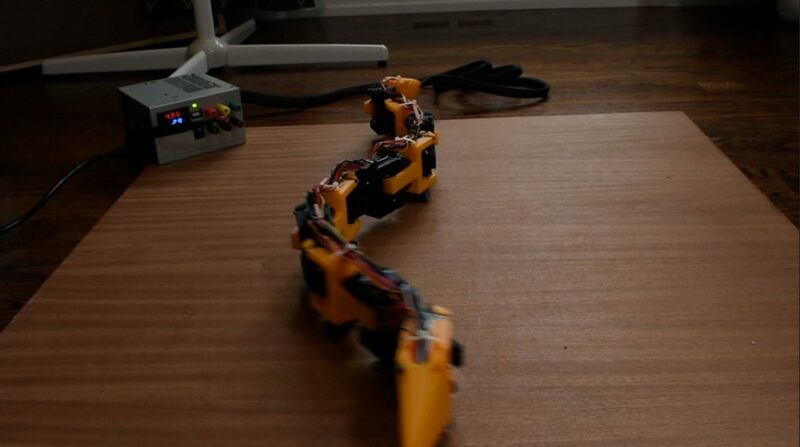 Donaldson’s project uses 10 metal gear servos to allow his robotic snake to curl its body back and forth, sliding along on small wheels that replace a real serpent’s bottom scales. An Arduino Nano controls its 10 segments, and power is provided by an external tether from a recycled desktop power supply. As shown in Donaldson’s video, he’s been experimenting with several different snake builds and forms of locomotion. These include an inchworm-style gait where sections are picked up off of the ground, and a sort of hybrid configuration where a snake can move in both the horizontal and vertical planes. Instructions and code can be found in Donaldson’s write-up here, and you can check out the video below to see more about his design process. 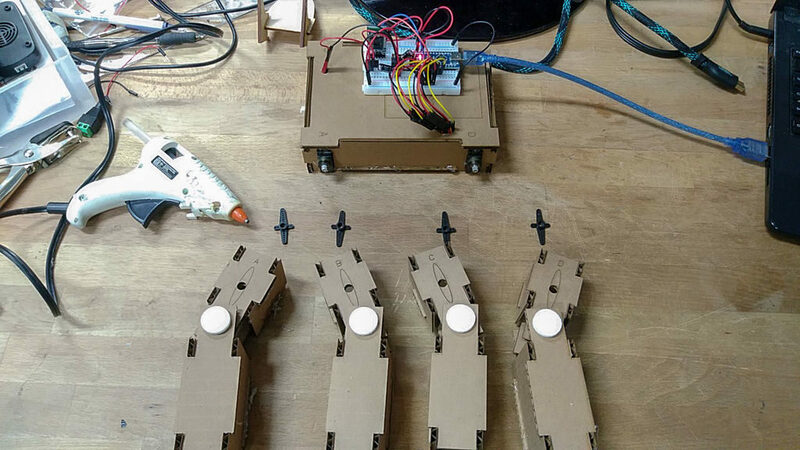 While building a walking robot especially with less than six legs can be quite a challenge, maker “Skill Mill NYC” decided to construct a quadruped robot named DoggoBot using cardboard for its body. 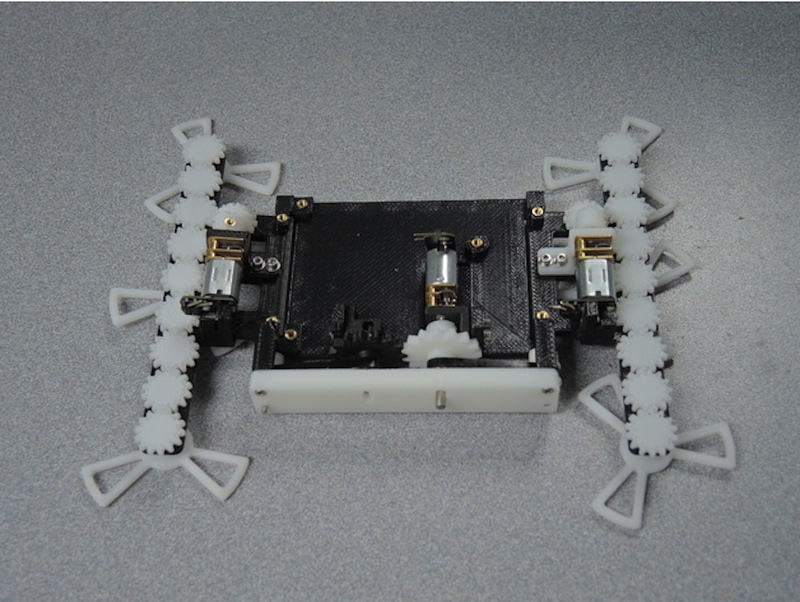 Four micro high torque servos power the legs, which are able to move the robot around with the help of unpowered knee joints. DoggoBot is controlled by an Arduino, and it takes movement commands via a computer USB-serial connection or from a Bluetooth module. 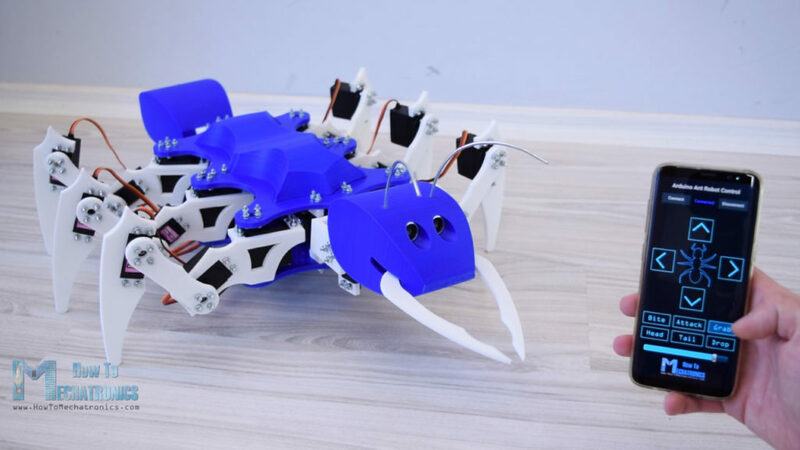 Ever since I started programming Arduinos, I wanted to build a robot using one. I also want a dog. However, living in NYC makes it tough to take care of a dog. So after hours of watching videos of robots and dogs, I decided to put my phone down and build myself a pet! 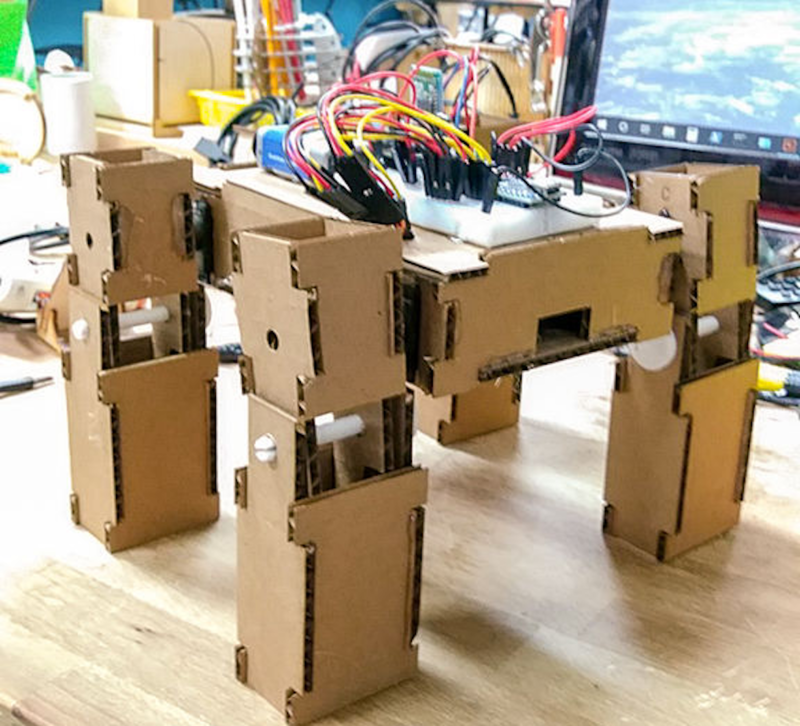 Although what’s seen in the demonstration below is an impressive feat of “cardboard engineering,” its creator has a few more ideas for it, such as adding sensors and getting Doggo’ to turn. Up until the present day, if you need butter, you simply ask another human to “pass the butter,” leading to minor inconvenience and awkwardness. 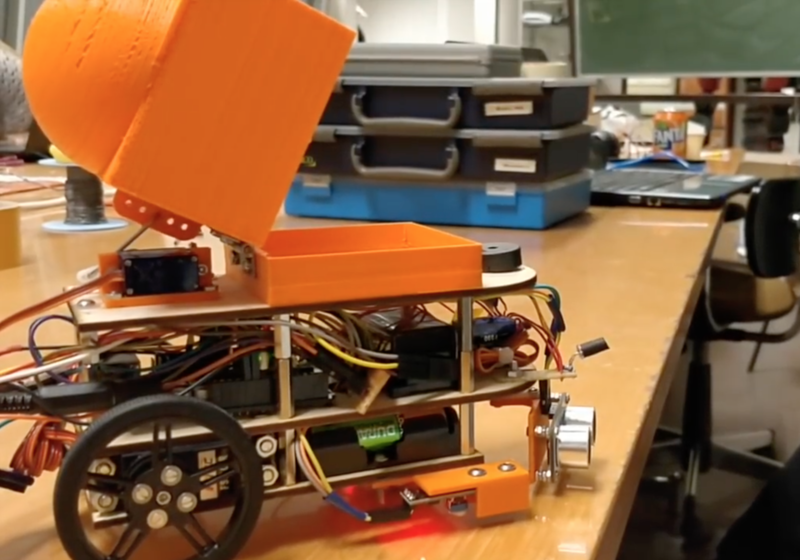 Engineering students in Brussels have come up with a novel solution: a robot that brings the butter to you! 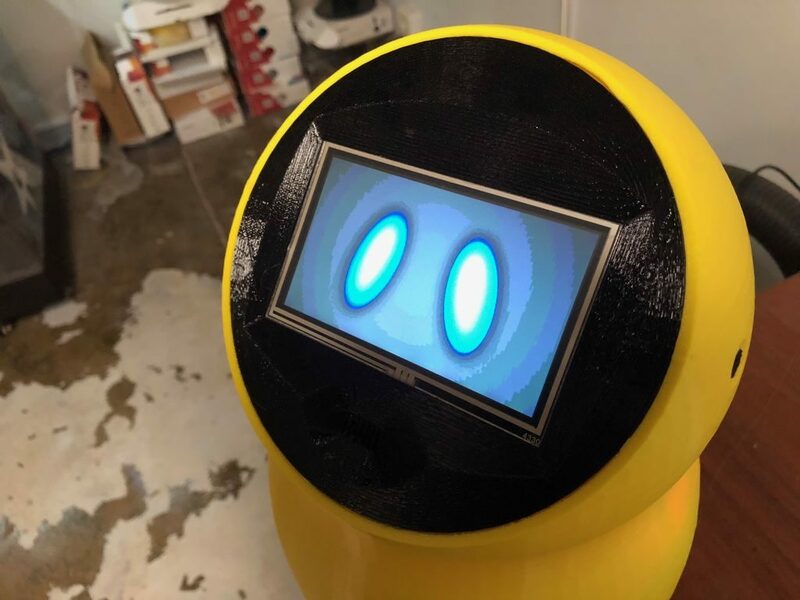 The robot, inspired by Rick and Morty’s Butter Bot, is powered by an Arduino Uno and summoned to hungry humans via an infrared remote control. 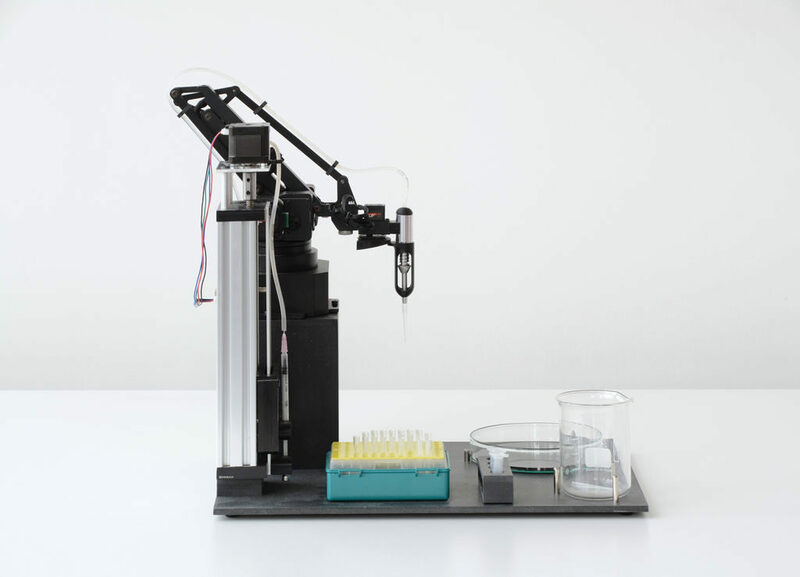 When the signal detected by onboard IR sensors, the robot moves over using continuous-rotation modded servos, then flips its cap-like lid to reveal the butter inside. Want a Butbot of your own? 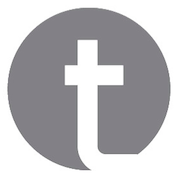 You can find the build process and code in the student team’s write-up here. 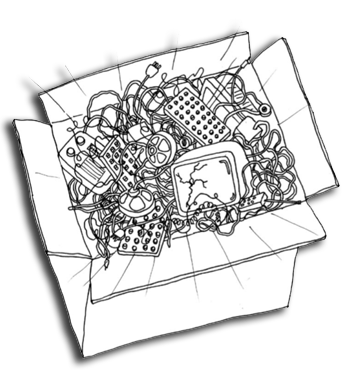 You are currently browsing the archives for the Arduino Robot category.